Dittmar Gallery’s newest exhibit features art made from recycled materials. Chicago-based artist Victoria Martinez created the display to explore the concept of nostalgia. On a excursion to Mexico, Chicago-based artist Victoria Martinez explored Mexico City, where she climbed the Pyramids of the Sun and the Moon at the ruins of Teotihuacan and was immediately inspired, she said. Photographs of structures from her trip influenced the sculptures in her newest collection, “Wizard Can,” which is on display at Dittmar Gallery until April 30. Using a mix of recycled textiles, bubble wrap, colorful paint and other materials, Martinez said she created the 16-piece exhibit as an exploration of the concept of nostalgia. Communication sophomore and gallery curator Joy Kim said during the planning process for this year, Dittmar’s selection team chose to feature Martinez because it was looking for artists who worked with slightly irregular materials, such as Martinez’s use of bed sheets and scarves. Martinez said she acquired many of the materials for the exhibit in unexpected places. Some of the bed sheets were from thrift shops, and the scarves in the exhibit were gifts from friends. Although Martinez makes some art out of objects with unknown pasts, she also holds a connection to some materials used in her general work as an artist, she said. 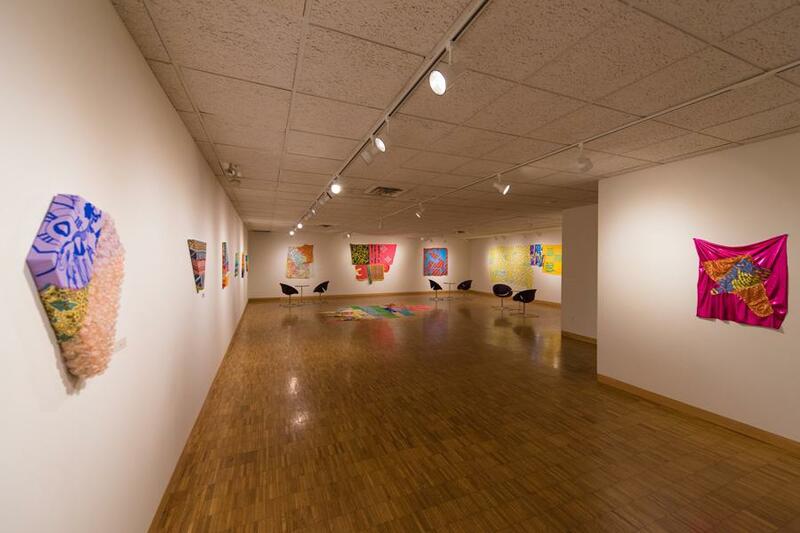 Previously, she has incorporated her Latino heritage into her work by using leftover colorful streamers gathered after a Mexican parade, and she incorporated some of her own items into this exhibit as well. This exhibit differs from past Dittmar exhibits in that it focuses on an idea, rather than exploring a social issue, said Federico Arroyo, an art services graduate assistant at Norris University Center. Martinez’s work is more about the exploration of vibrant textiles and visuals, he said. Kim said every artist the selection team picks to feature has a different message they seek to share with the Northwestern community. Part of Martinez’s message is the power of sustainability achieved by reusing materials and reenacting them in different ways, a topic that is relevant and often explored today on college campuses, Kim said. Martinez will give a speech about her exhibit at Dittmar on April 28.